Amateur sports and teen drama is presented in a simple but effective way. Carly Usdin has created another cast of intriguing characters that will definitely captivate the Young Adult audience and anyone else who enjoys the BOOM! Box Imprint. Following on from a string of popular sporting themed comics, The Avant-Guards, published by BOOM! Studios, is a teen drama centered around a basketball team comprised of drama school students. Writer Carly Usdin (Heavy Vinyl) takes the reader back to college and reminds us how difficult it can be to settle in and make new friends. The adventure opens with Charlie Bravo on her first day at the Georgia O’Keeffe College of Arts. Having just transferred to the college, she feels isolated from the other students and builds a wall of indifference around herself. Despite trying to avoid unnecessary contact with people, she is strangely drawn to Liv, captain of the college basketball team. Usdin has created a varied cast of characters and introduces these to the reader en masse in the first issue. Using Charlie as a focal point, the reader starts as an outcast and can only engage with the rest of the cast as Charlie does. This helps to establish the isolated atmosphere that is so important in this issue. 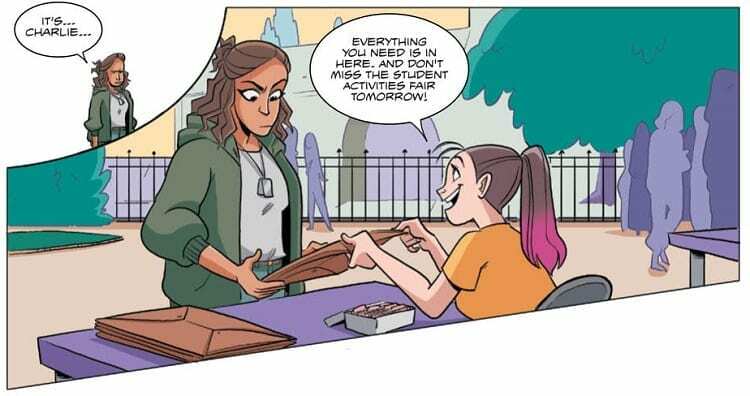 Usdin wants you to understand how Charlie is feeling so that as the series progresses any emotional high, or low, that she feels you will also feel. This is achieved surprisingly well in the first issue of The Avant-Guards. Usdin gives the reader snippets of insight into Charlie’s life, just enough to understand her reactions in certain situations, but not too much that there are no secrets left. We identify with the central character because we recognise these smaller interactions that she has. The dialogue is befitting the cast and several of the characters already have distinctive voices that shape our understanding of who they are. Just like BOOM! Studios other hit sporting drama Fence, The Avant-Guards has a niche market, especially if you are considering the sport of amateur basketball, but the true story is not the setting or sport, but the character’s development. Usdin has created a fascinating collection of students for her story and instantly makes the reader want to follow them through their adventures. 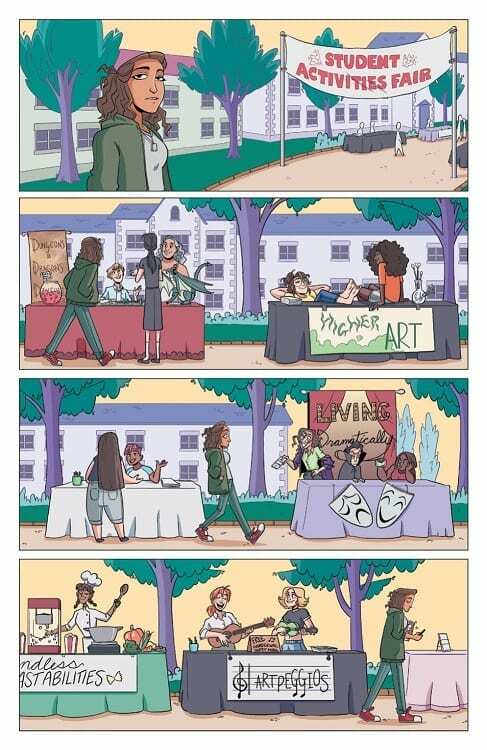 The art work has that Young Adult appeal that has made comics such as The Lumberjanes so popular. The pencil lines are fine outlines which define the shapes of the characters and setting. The art works to tell a character based story and Noah Hayes is wonderful at capturing expressions and emotions in a minimalistic way. His strongest attribute in The Avant-Guards is his ability to create an emotional reaction from positioning and scale. At one point he demonstrates exactly how isolated Charlie feels by drawing her small in an already, unusual shaped, small panel. In contract to the rest of the panels on the page this moment seems significant to the reader as all they are faced with is a tiny Charlie, on her own in a sea of nothing. Later on Hayes uses the minimalistic approach to illustrate how empty Charlie’s life is. A panel in her bedroom seems so much bigger than it is because of the empty space. A single poster adorns the wall and half of the panel is made up blank wall space. Here the colors by Rebecca Nalty really help to hammer home the point. By leaving so much of the panel color free, it emphasises the expanse of space a lot more. Another wonderful coloring technique that Nalty applies to this issue to help the narrative theme is to defuse a lot of the background images with bleached colors. 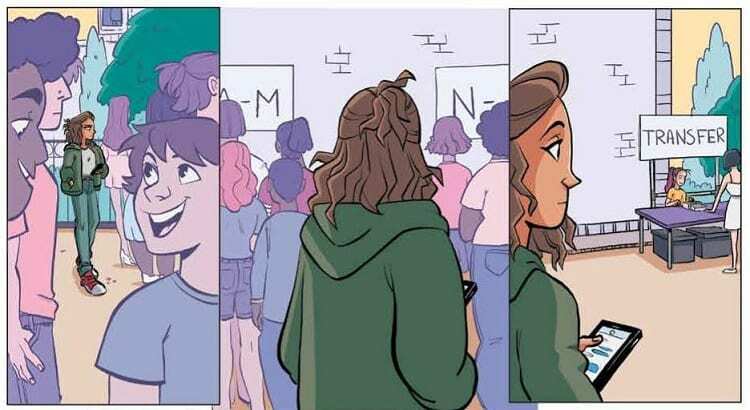 This makes the central character of Charlie stand out in a sea of people that are different to her. A quick glance of the opening page and the reader knows that Charlie is an outcast. The lettering on the sound effects is muted and play full. The coloring is a cool blue so it never imposes on the art work but still stands out when it needs to. Ed Dukeshire has a lot of dialogue to handle on some of the pages which he does by evenly spacing the text and allowing for plenty of free space in the speech balloons so that they never seem over crowded. He also distributes the dialogue between a number of different, often linked, balloons. This gives some pages the impression of a lot of speech which in turn makes the silent pages somehow quieter. The Avant-Guards is another intriguing entry into BOOM! Studios’ BOOM! BOX imprint. It fits in perfectly with the titles that have come before it, especially the sports based comics such as Dodge City and Slam!. Just like those titles the sport element itself is merely a literary device to get the characters to interact and give them a challenge to overcome. Usdin proved with her previous title Heavy Vinyl that she can create intriguing characters and she has done the same here. There is a fairly large cast of characters waiting to be explored and the story is barely beginning. 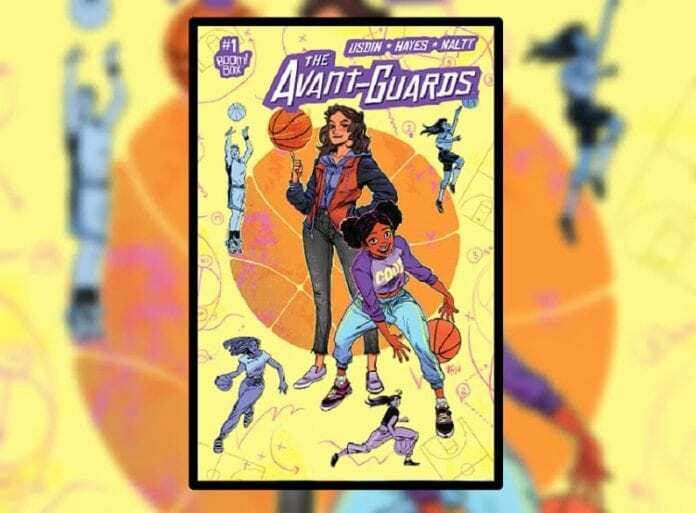 The combination of clever artwork and a commitment to making it easy to read means that The Avant-Guards is easily accessible for new comic book readers but contains enough for seasoned comic lovers. It’s humorous, fun and bounces along at a steady pace.